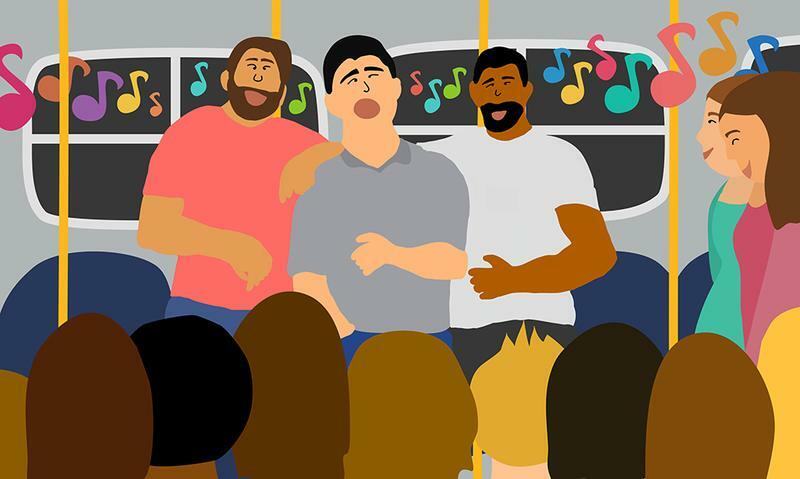 Have you ever gotten on the 99 only to suspect you took a wrong turn and ended up at a performance of the Men With Triceps The Size Of Belgium Choir? On the off chance that the lads I’m about to describe wish to remain anonymous, I’ll refer to them collectively as Totally Not The UBC Men’s Rugby Team. And it was they who blessed us with this melodic prowess. Totally Not The UBC Men’s Rugby Team was killin’ it. I’ve never seen Oasis live, but I have been alive since the early-to-mid-’90s — so basically the same thing. And I mean it when I say TNTUBCMRT’s “Wonderwall” captured the original poetic intentions that had evaded all attempts at this masterpiece until now. Granted, I may just have been tricked into thinking they sounded good because of how passionately they bellowed out what are essentially English non sequiturs... That would support my theory that you can have the vocal ability of a car alarm, but so long as you move your voice up and down way too much and sing way too loud, people will effinglove it. Looking at you, Celine. The gang and I spent what would have been, under normal circumstances, a boring 10-minute bus ride instead basking in the serendipity of many muscle-y dudes doing their best Danny-Kaye-on-a-three-day-bender impression. They had by now moved on from “Wonderwall” and were wailing out Northern Irish sports cheers that I assume are understood by nobody west of the Mid-Atlantic Ridge. One dude was foot-tappin’ with the gusto of a hundred Viking marauders. I estimate there was a 50 per cent chance of him stomping straight through the bus floor and disrupting traffic patterns throughout the Lower Mainland. But as the saying goes, “All good things must come to an end or continue on the same bus once you reach your stop and leave you with nagging FOMO.” The muffled melody trailed off, complete with Mr. Gusto’s thunderous foot-stomping. At least, however, I can say with certainty that somewhere that night were many angsty teens whose acoustic variations of the same song were all bested by Totally Not The UBC Men’s Rugby Team, simply because they were really, really loud. And that’s all it takes.